I recently got VC3 so now I can really start doing some translations. I would like to play through the game once before I go through to translate the supplementary information, so for now I am planning on translating things relevant to gameplay. So far it doesn't look like anyone has translated the characters' personal potentials, so that's what I'll be doing now. I don't have a lot of free time right now, but I'm going to try do three or so of these each time I get a chance to play. Although I'm not far into the game yet, because I am using the Japanese wiki to draw information from, my translations will include all of the potentials the characters get throughout the game. After I complete all of the characters I plan on reorganizing and tidying up all of the information. So until, please keep in mind that these are rough translations. I will pretty them up later and I am considering trying to match my phrasing and terminology to match that of the localized VC1 and 2. Accuracy, evasion, anti-personnel damage, anti-tank damage, defense, status ailment resistance increase. When under interception fire accuracy increases. Boost to defense while on cement. When 3 or more allied units are nearby, accuracy, defense, anti-personnel damage, and anti-tank damage increase. When allied units are nearby evasion increases. When HP drops below half, HP recovers. After ending targeting mode from an attack, HP recovers fully. When under interception fire defense and accuracy decrease. 未来への不安 Worried about the future. (After Chapter 9) Replaces "The Grim Reaper Label"
Once AP drops below half, no longer able to move. 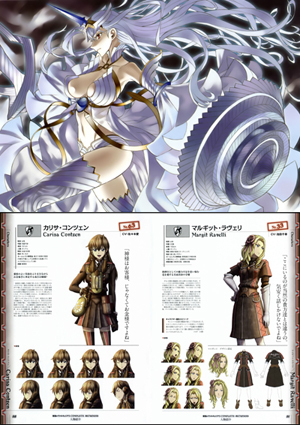 ヴァルキュリア Valkyria (After Chapter 16) Replaces "Worried about the future"
When HP Drops below half, accuracy, evasion, anti-personnel damage, anti-tank damage, defense, status ailment resistance increase. When no allies are nearby defense increases. When AP drops below half, evasion decreases. When standing on the ground, accuracy and anti-personnel attack increase. When 3 or more enemy units are nearby, evasion and defense decrease. 新たなる道 A New Path（After Chapter 18) Replaces "Oath of Revenge"
When 3 or more enemy units are nearby, anti-personnel, anti-tank, and defense increase. When Darcsens are nearby, regardless of if they are friend or foe, accuracy, anti-tank damage, and defense increase. When 3 or more allied units are nearby defense increases. When under interception fire defense increases. Anti-personnel and anti-tank damage decrease. 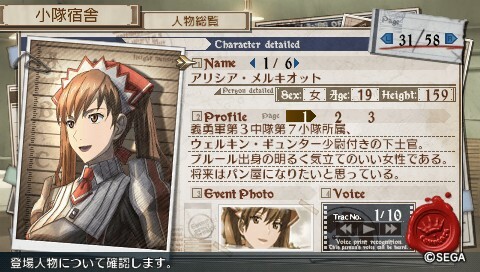 猜疑心 Suspicious（After chapter 8） Replaces "Idealist"
When enemy units are nearby accuracy and defense decrease. This was announced a while back, but I thought it would be good to throw everyone a reminder. 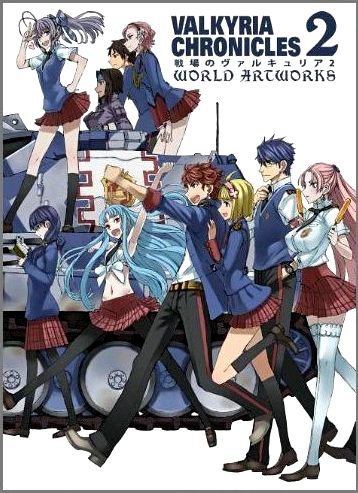 UDON Entertainment will be releasing the Valkyria Chronicles 2: World Artworks later this year. Despite several release date delays, they did an excellent job with the first Valkyria Chronicles artbook. So if you're a fan of RAITA's art or just want to see behind the scenes details about the series, it would definitely be a good idea to pick this up. Pre-orders are open on Amazon, so if you're thinking about buying it I would highly recommend that you pre-order, not just because it is beneficial to the publisher but also because you'll be able to save some money. I pre-ordered the first artbook about a year before it was released (due to all of the delays) and thanks to Amazon's pre-order price guarantee, by the time it was released I ended up paying much less for it than its final price. So if you're interested in pre-ordering, click here to be taken to the Amazon product page. 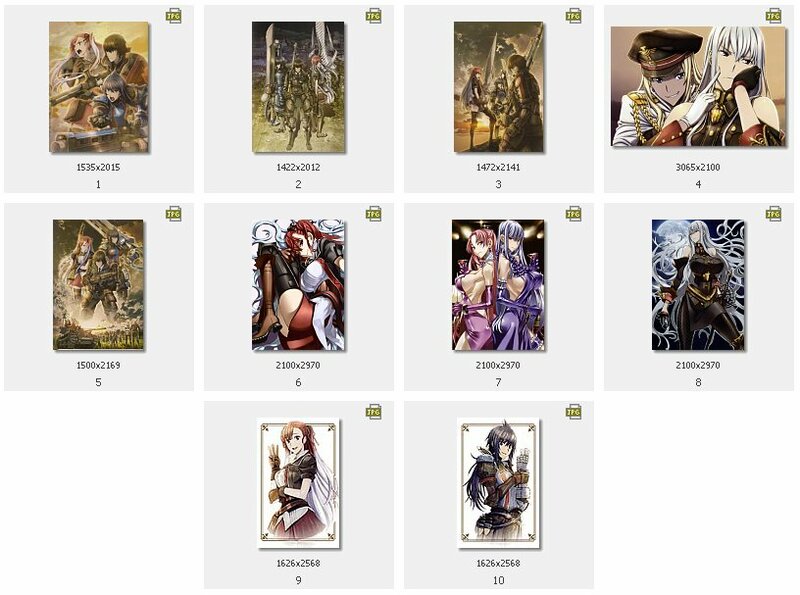 Something else to keep in mind about these artbooks is that even though VC3 has yet to be released outside of Japan, if we show UDON through the sales of the artbooks that we would like to see the VC3 artbook as well, we may have a chance at getting them to release that too. So if you want to see the VC3 artbook in English at some point, make sure to purchase the VC1 book if you haven't already and pre-order VC2's! The original biography is 3 pages long, but because the text in English is longer, I had to make it 5 pages long. I hope you enjoy it. 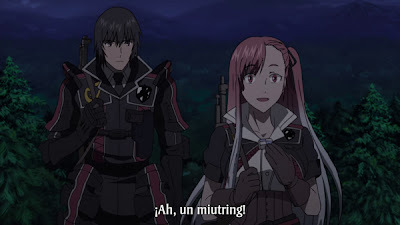 Finally something to report in my own language!, for those who speak Spanish, you can now watch the Senjou no Valkyria 3 anime with Spanish subtitles. 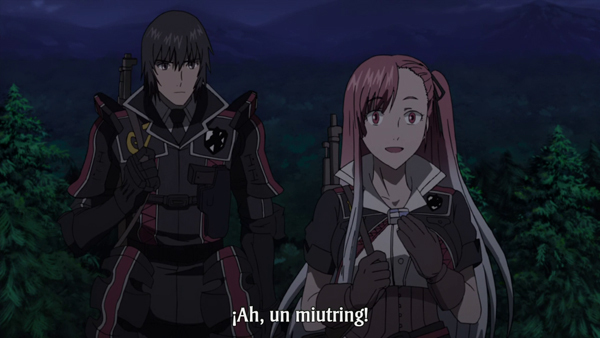 Both OVA are available in one single file thanks to the Spanish fansub groupAnime Undeground. ShinobiMuramasa and I are working on some translation projects right now and we wonder if stuff like this is something that you will like to see. 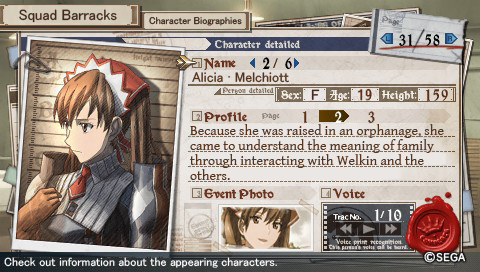 This is a preview of Alicia's character biography in Senjou no Valkyria 3, ShinobiMuramasa did the translation and I did the easy part (screen capture and graphic edition). Sorry for my lame attempt to speak French. 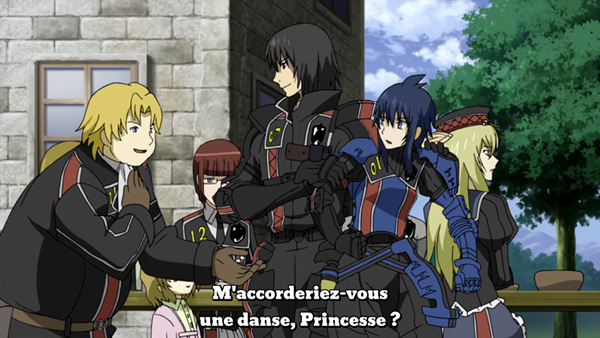 A fansub group called Ms-FR finished last year the French fansub of Senjou no Valkyria 3: Dare ga Tame no Juusou Vol.01 and 02. 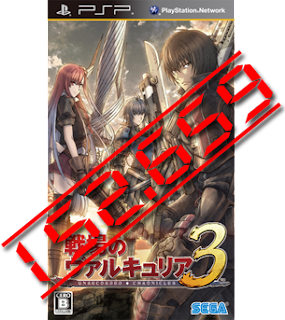 -The data comes from Media Create annual sales report (Senjou no Valkyria 1 & 2 games) and Famitsu annual sales report "provisional" (Senjou no Valkyria 3 games). -Digital sales are not tracked. -Media Create is regarded as the most complete and reliable source, but their chart for 2011 top sales games is not yet available, so I'm using the "provisional" Famitsu chart for Senjou no Valkyria 3 games. 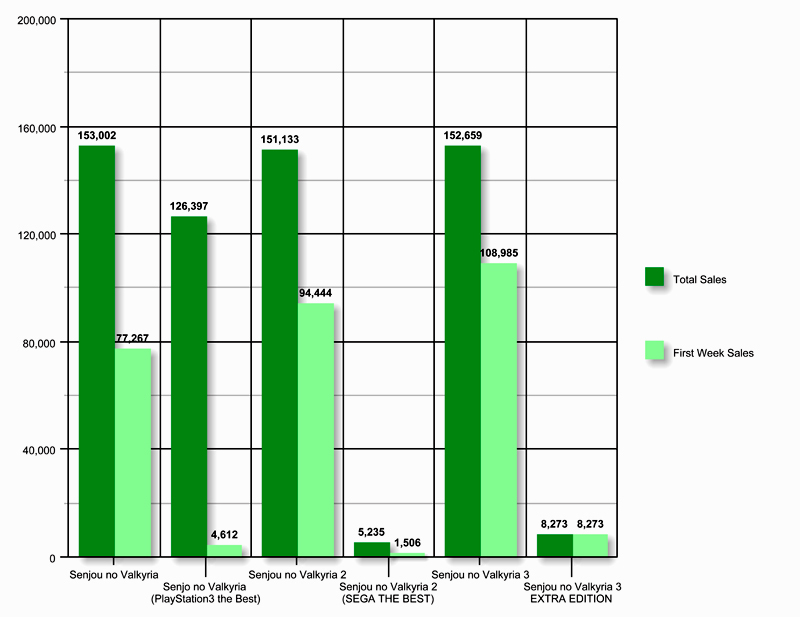 -Sales for every game are slightly bigger because when the games can't reach a set position in the sales chart, the data is no longer provided to the public, but at this point in the game lifespan, sales are minimal and don't represent an impact in total sales numbers. -There is something odd going on with the Extra Edition, the game was released in November, 23 and the Famitsu chart tracks till December, 25, so there is some data missing. 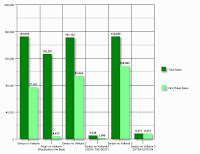 I will bring you any update if needed when Media Create 2011 chart is available to the public. All in all, I think is safe to say that there is a strong fanbase in Japan, all the regular releases of the games has reached 150.000 copies sold. It's true that we don't know how much they spend to make the games or how much profit Sega gets from them (plus toys, books...) but there are games that sold way less and they get sequel all the time. Hi everyone! While Valkyria Chronicles news may be hard to come by right now, Raita on the other hand keeps giving us fans something to look forward to! According to his twitter, Misa-nee from his Magical Girl doujinshi series (the 8th issue was posted on the blog previously) will be getting a figurine! He also posted a picture of the figurine’s prototype on his twitter, but it was promptly taken down. Do not despair though! we were able to save the picture before it was taken down. Raita goes on to hint that if this figurine gets popular, it’s possible that figurines of the other three girls could be made. So if you’d like to see that happen, be sure to import the figurine when it’s released! Keep checking back for more information, we’ll be sure to keep you updated! Both doujinshi published by RAITA in the Comic Market 81 are available now. Your typical doujinshi with material that is not safe for work or for under-age people. I uploaded it as I got it, any censoring done is not my own doing. This is more than anything a sketchbook with designs from previous doujinshi and some unused stuff. If you don't mind some girls without any clothes, you are safe. Hello everyone! I'm ShinobiMuramasa and I'll also be posting on the blog from now on. I suppose I should start off by telling you all a bit about myself. Naturally, I'm a huge fan of Valkyria Chronicles. I was initially drawn to the series because its blend of strategy, RPG, and shooting elements looked incredibly innovative. Once I got the first game I was hooked and it has easily become one of my favorite video game series. Like the rest of you I was very disappointed about Sega's decision not to release VC3 outside of Japan. Last summer I spent a lot of time organizing VC fans on various video game boards, Sega's board, Twitter, and Facebook to voice our support for the game. I also created topics on the Atlus, Aksys, NIS, and XSEED game request boards to see if it would be possible for someone other than Sega to localize the game. If you were around then my name may be familiar to you. Despite receiving heavy support on all of those fronts, our voices fell on Sega's deaf ears with them essentially telling us to leave them alone. Discouraged with Sega of America's lack of fan concern, I left the VC scene for a while and resigned myself to importing VC3. The next time I returned to check on VC news I noticed the recently started Gallian Liberation Front Campaign. I don't know whether or not any amount of fan support will matter to Sega, but hopefully the voices they heard from my movement as well as the Gallian Liberation Front will have some kind of impact. In the midst of the discouraged and dejected mood surrounding the fate of VC outside of Japan, I came across this blog, which I saw as a ray of light for all VC fans. Even if Sega of America/Europe won't release VC3, and possibly future installments, outside of Japan, as fans we cannot allow the series to fall into obscurity. As a series, Valkyria Chronicles is thriving and is very much alive. Even if the information about new products or related material is not quickly accessible to us, it is still available and Riela Marcellis has done an excellent job sharing that information with all of the fans. Finding this blog played a large part in rekindling my passion for the series. I have been following it for quite sometime and have wanted to contribute in some way for just as long. Riela Marcellis was kind enough to accept my request to help, so here I am. Thus far the coverage on VC, RAITA, and other related news has been superb, but I intend to work hard to increase the information that we post even further. I am a proficient reader/writer/speaker of Japanese, so I intend to utilize that to further improve the amount of news we cover. Hopefully we will start getting VC news outside of Japan, but until then we will just have to follow the Japanese news closely. This is a blog for the fans by the fans, so we very much would like to hear from you. If you find something that you feel other VC fans would like to know about, please do not hesitate to contact us. If you find something in Japanese that you think we should know about, please feel free to send it to me so I can work on translating it. Thank you very much for reading and I am looking forward to posting! I just found that someone translated the interview with Yuichi Nakamura that it's available on the official site. Enjoy!. If you have any problem reading the subtitles, just go to youtube to watch it properly.